Infinite Art Tournament: March Madness: South and East Finals!!! The Rules: For each of the pairs of flags pitted against each other, indicate your favorite. Explication, derision, and/or analysis will not affect the scoring, but is nevertheless encouraged. 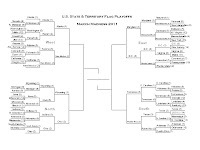 Each winner will advance to the Final Four. South and East Finals Voting Deadline: 9 p.m. PDT, TOMORROW, Tuesday, March 22. Difficult choice. I live in Maryland, but DC has simplier lines. I like both of them in different ways. Another hard one. Tennesee and Texas are both good. Texas is traditional, Tennessee is unique. 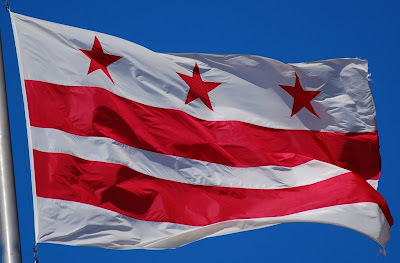 District of Columbia over Maryland. And may God have mercy on my soul. I'm dreading next round. How are we going to break it to gS49? Very VERY disappointed that Indiana is out of contention (my grandmother experienced something similar with Notre Dame's loss this weekend) and I will miss Hawai'i's colonial-retro look. But life goes on, and I'm going to stick with feudal racecar Maryland just for the hell of it (though in all honesty I prefer DC's flag) hoping for an upset due to the votes of other people such as myself who don't mind mixing polka dots and plaid, and will select Puerto Rico over Tennessee for purely political reasons, plus they really should be a state by this point, so I figure they need all the help they can get. I have to go with Maryland, gaudy and memorable, which makes me want to lead schoolchildren in heraldry-based art projects with scissors and construction paper. I chose Tennessee over South Carolina, and Texas over Puerto Rico. But seeing them together, the starry bowling ball has gone flat for me. I'll take Puerto Rico for its balance, harmony and admirable flagginess. Man, I disapprove of about 75% of the flags that made it it the Finals. 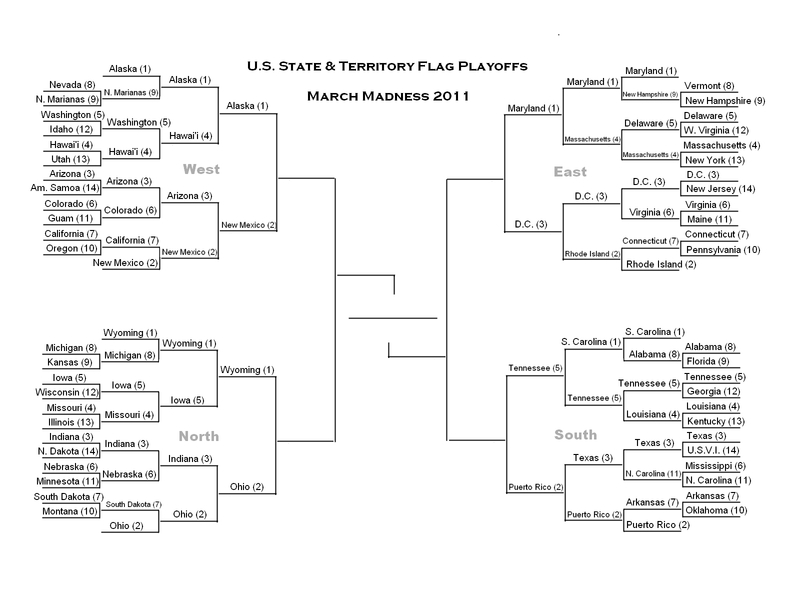 MARYLAND and TENNESSEE. MARYLAND! - it's gaudy and daring! It violates major graphic design principles! It's unique as crap! While I like some aspects of the DC flag it just seems a bit too "meh" for my tastes. While I would sooner order a Bacardi than a Jack Daniels I'm going with TENNESSEE! Puerto Rico's flag is quite excellent but ordinary. 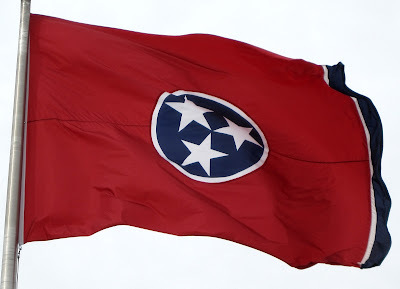 I like the way Tennessee sneaks in aspects of the confederate flag and hopes that we don't notice. Also, they provided a nice gutter for the "starry bowling ball" to run into. I don't think either of these flags will stand up to the offensive juggernaut that is Maryland or to DC's tenacious D.
In other new Kansas over Illinois though I don't think the flags were involved. Rock chalk, jayhawk! "In other news" I meant to say. Also I forgot to capitalize Jayhawk. Puerto Rico over Tennessee. I'm really fond of Tennessee's flag, but Puerto Rico's is just gorgeous. Wow. Well since I think Maryland's is bar none the worst flag, my vote goes to whoever it is facing. And in a closer match, Tennessee's since it is even cooler when looked at while wearing 3d glasses. 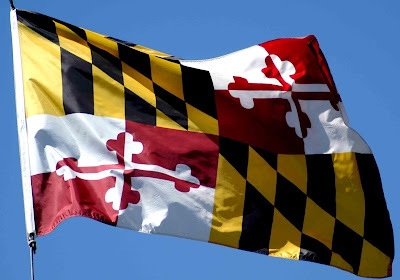 I only allow one flag per state, and Maryland, that's four flags. The vote definitely goes to DC. Both are red white and blue. 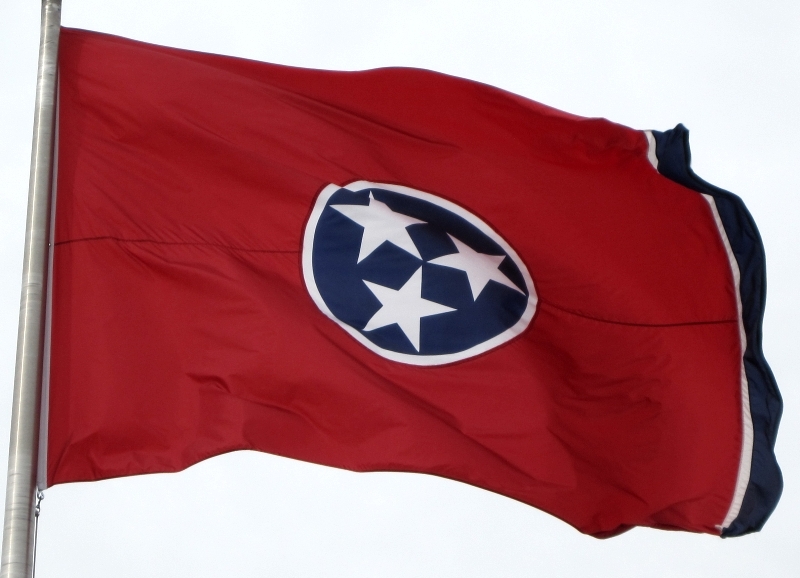 Tennessee has three stars to Puerto Rico's one. Both have stripes. Tennessee has a circle. Puerto Rico has a triangle. Puerto Rico fulfills the classic flag requirements. Tennessee is original and different while still well-designed. Someone's "gas station logo" comment from the first round is still festering. But I think I'll still give it to Tennessee. Maryland and Puerto Rico. Tennessee is slowly growing on me, but it's not there yet.